After visiting my family for the month of May I traveled back to Europe for the summer race season. 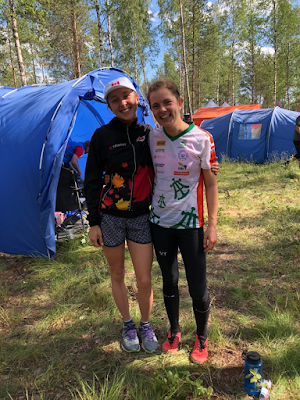 I would be running for my club Fossum IF at Jukola, a few days later racing at the Norsk O Festivalen: Norway's largest weekend of orienteering races, and then head to Hungary to compete at the Junior World Championships (JWOC). JWOC Updates will be coming in the following weeks so stay tuned! For Finnish orienteers, Venla and Jukola is the highlight weekend of the entire year! Discussions about the team order have been taking place since the year before and “jukola trainings” have become more and more frequent as J-day approaches. Running for a Finnish club means that there’s a lot of excitement, a lot of nervousness and a lot of expectations for performing as a team. I’ve been running with the girls from Angelniemen Ankkuri for four years now and we have worked hard to learn how to support each other as individual runners as well as part of a team. In the changeover, no matter what has happened, I am always so proud of the girl handing off to me because we know that we have all done our best. This year, I was running second leg; a new relay leg for me with the added excitement of being sent out in 10th position! In the recent months, I haven’t been able to train as much as previous years which is very apparent when comparing my physical level with those in the top of the field. Good thing this year’s terrain added some spice to the technical aspect of the orienteering! It was a fight from start to finish but I knew that I just had to focus on choosing routes, executing them the best I could and knowing the exact control placement in the detailed terrain. One control, after the other, after another and all of a sudden it was only empty field between me and my next leg runner, Sanna! 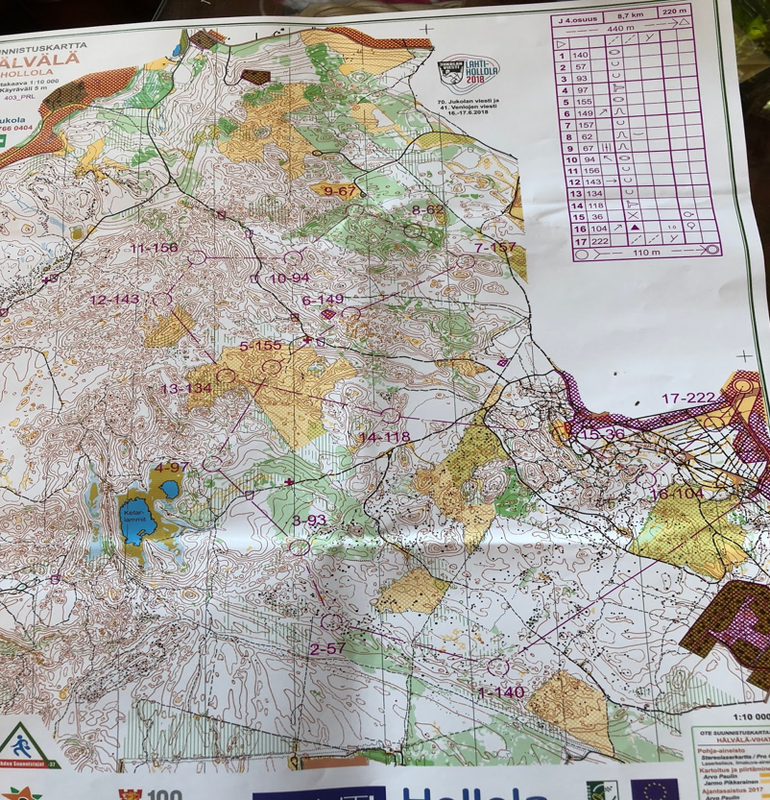 After the race, Sanna told me that when she could distinguish my face behind the map that I was barely holding up while running towards her, she knew that it had been a tough go and what was waiting for her out in the forest. Sanna's mandatory hug after finishing her leg! We all fought our hardest and did our best with what we had on the day. There can be strong disappointment felt when one doesn’t accomplish a goal but that should be only fleeting when one has amazing teammates to lift each other up and strive for even better next time! As the mosquitoes came out and the night got (somewhat) darker, the first leg Jukola relay runners headed off at 11pm! This year, there were roughly 1900 teams registered for this 7 person relay - over 13 000 people! I (Emma) was running with Team OUSA on leg 4 - my first race in the Jukola relay. 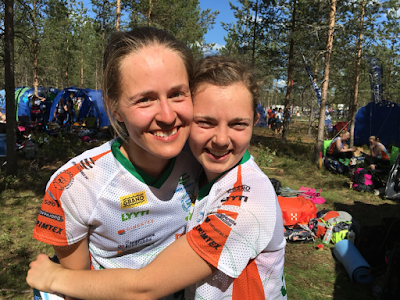 This team was made up of mostly Jr runners, and even some who had only orienteered in Finland once before. 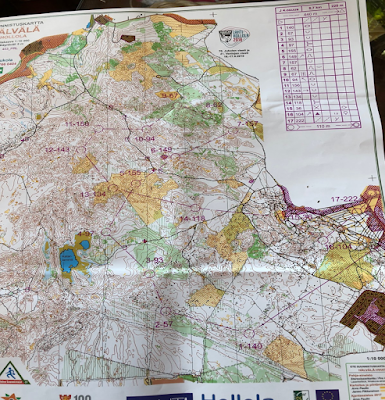 After getting a decent rest after the Venla mass start in our lovely military tent with a large hole in the dirt inside (very home-y) I started getting ready for the second race of the day. I forced some contact lenses into my eyes that were still full of dust from the mass start and stabbed myself while putting on my bib in the dark, and then finally headed over to the warm-up area to wait for Thomas Laraia to run his 3rd leg. The start area was crazy, there we so many people running around and waiting for their teammates for the handoff, something that I had not experienced before in the mass start of Venla this year and last. It was chilly out at 4am, but the sun was rising quickly. 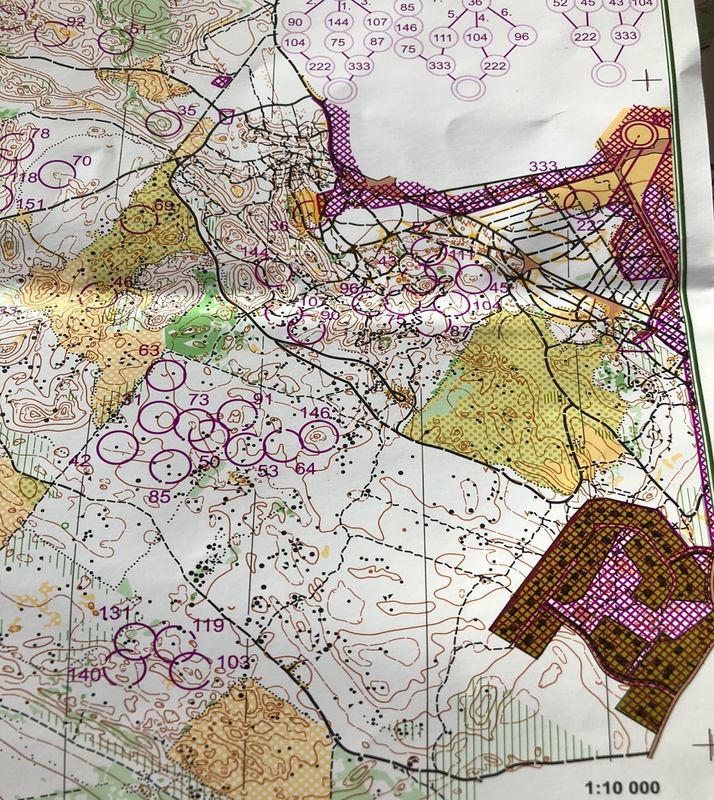 I got the map from Thomas around 4:30am or so, and headed out on the 8.8km course. The course started out in the same direction as the Venla leg 1 course did, so I was sort of familiar with the area. However I didn’t really get fully into the map by the time I approached control #1 and I ended up visiting some of the other forkings before my own. You can see the 4 forkings at the bottom of this image (140, 119, 131, 103). I had #140, what would your route be? The rest of the course was a combination of mistakes and a few good controls, but veering towards the mistake side of things. I was feeling sort of flustered after a particularly large mistake at #7 and #8 so I really tried focusing in again and after that things started to pick up and I was navigating well for a while. I took a very bad fall to 10 and ended up bruising my knee pretty badly. That took about a minute to feel okay and I could run faster again, but it got tight after a large mistake at the second last control. So overall, an okay run, but I was much happier with my Venla race. Though, with the sun rising over the pines, it wasn’t so bad to be out there a second time! I even managed gain some places. If only the chocolate-licorice protein bar given at the finish line actually tasted good! Your authors, Emma and Emily! We had to schedule this meet-up for this photo so that we would be sure to find each other amongst the masses of orienteers!